Tag line: "A Whole New World Awaits"
I have to admit, I’m having a great time watching these IMAX documentaries. Filled with gorgeous imagery, they offer a peek at areas of the world most of us will never visit. A few, like 2006’s Roving Mars, take us further still. 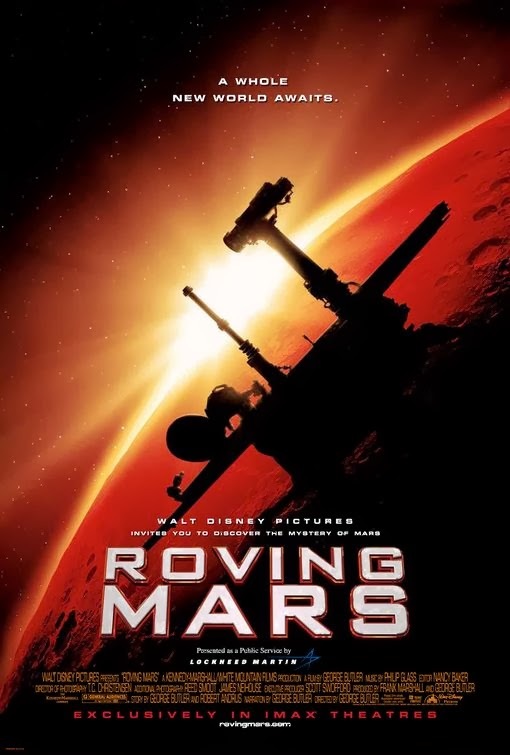 Narrated by Paul Newman, Roving Mars is a behind-the-scenes look at a special NASA project, where two rovers, nicknamed Spirit and Opportunity, were sent to Mars to explore the planet’s surface, collecting information that will assist researchers on earth as they attempt to determine if life ever existed on the red planet. Interestingly enough, the first half of Roving Mars is very much earth-bound, introducing us to Steven Squyres, an astronomer / geologist responsible for overseeing the construction of the two rovers at NASA’s Jet Propulsion laboratory. As Squyres puts it, the rovers, decked out with the latest in geological equipment, will act like detectives as they traverse the Martian landscape, looking for clues to help researchers figure out what sort of life, if any, occurred on Mars (a now-desolate planet, its surface features numerous canyons and mountain ranges, suggesting that, a very long time ago, water may have flowed there, making it more “earth-like” than first believed). If successful, Spirit and Opportunity will beam back pictures offering a ground-level view of Mars while also gathering rock and soil samples, studying their make-up to shed some light on whether or not the red planet was ever alive. Of course, if Roving Mars was all rocks and data analysis, it would make for one boring motion picture. Once the rovers land on the surface (which is recreated via computer animation), we’re treated to a collection of fascinating photos, images that undoubtedly looked stunning on an IMAX screen. (Though mostly barren, Mars is nonetheless beautiful). Those who fancy themselves scientists will enjoy learning something new about our nearest neighbor in the solar system, but for the rest of us, Roving Mars is one hell of a breathtaking journey.